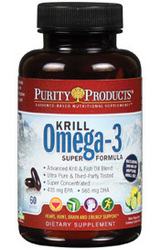 Purity Products®, a leading direct-to-consumer provider of premium dietary supplements, announces the release of their new Krill Omega-3 Super Formula. Unlike typical Krill Oil products, Krill Omega-3 Super Formula is an Omega 3 complex fortified with ultra-pure pharmaceutical-grade fish oils and Vitamin D. The combination delivers a more substantial dose of DHA and EPA, totaling over 1000 mg of EPA and DHA. While Fish Oil remains the dominant force in the ever-growing Omega 3 market, Krill Oil has been heralded for its unique phospholipid complex and the powerful natural Astaxanthin it provides. Phospholipids carry the EPA & DHA directly into the cells, allowing the human body to absorb them very easily. Astaxanthin, one of nature’s most powerful antioxidants, and a natural component of Krill, helps protect the body’s tissues from oxidative stress, and provides a wide range of other health-supporting benefits. To learn more about the Krill Omega-3 Super Formula and Purity Products®, please visit our website at http://www.purityproducts.com.